Have I mentioned that Harley is a Harry Potter fan? More like she is a tried and true Potterhead. 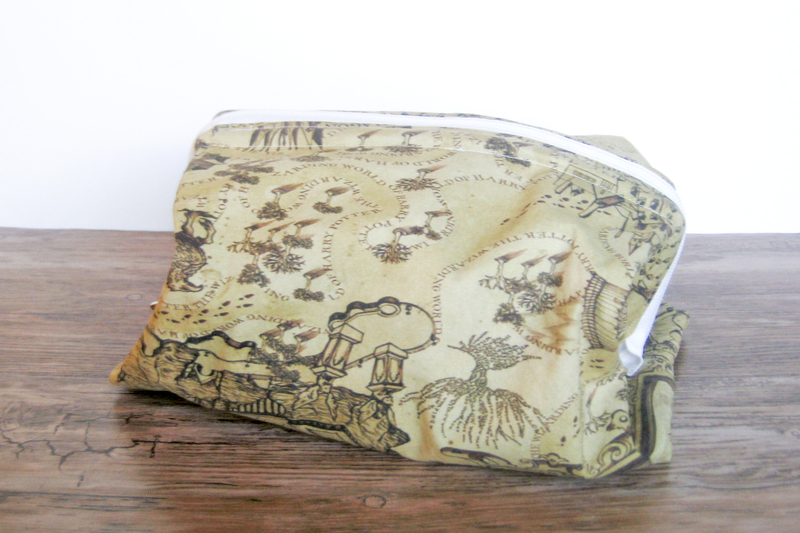 I found some fabric that looked like the Marauder’s Map a while ago on Spoonflower, and I bought a yard of it – one yard included two maps. I knew I wanted to make something for her out of it, but when I bought it, i had no idea what I would end up making. 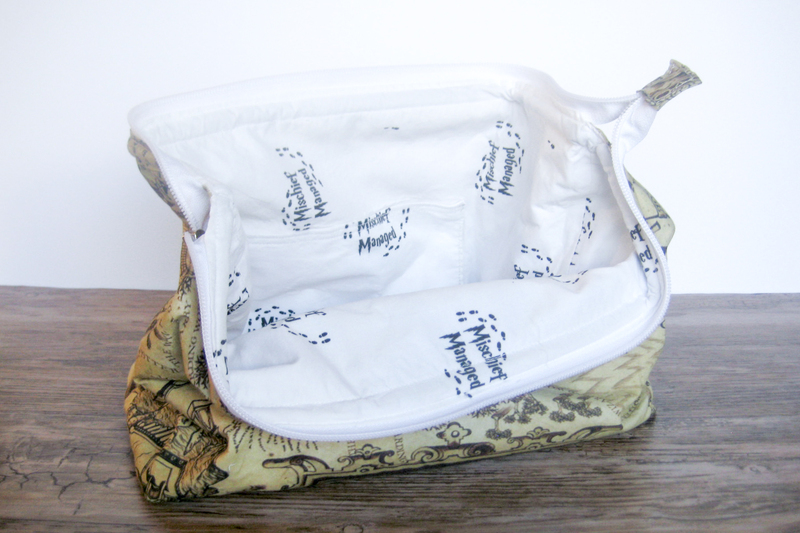 Eventually, I ran across the Emmaline Bags website and her FREE The Retreat Bag pattern! One thing Harley is short on in her bedroom is organizational options, and with the amount of traveling she does with high school sports, I knew this bag would be perfect! The pattern is very easy to follow, and Janelle’s instructions are clear and concise! I was really nervous making this because I have never made a bag with any sort of zipper in it before, let alone internal frame pieces. The Retreat Bag comes in two sizes, and the Internal Wire Frames – Style A and Style B – are available on the Emmaline Bags website, as well. I purchased the Bag Zippers there, as well. I did make quite a few mistakes in the process of making it, but nothing that makes it unusable for her. I started with fusible fleece that was way too stiff, so I removed it, which made the bag really floppy. It is supposed to be much sturdier than this. The second issue is that I didn’t pay attention to the fabric direction, and the exterior fabric is upside down. Not a huge deal, but since it is the Marauder’s Map from Harry Potter, it is pretty obvious. Similarly, I didn’t pay attention to layout when cutting the internal pieces, and that fabric is sideways. 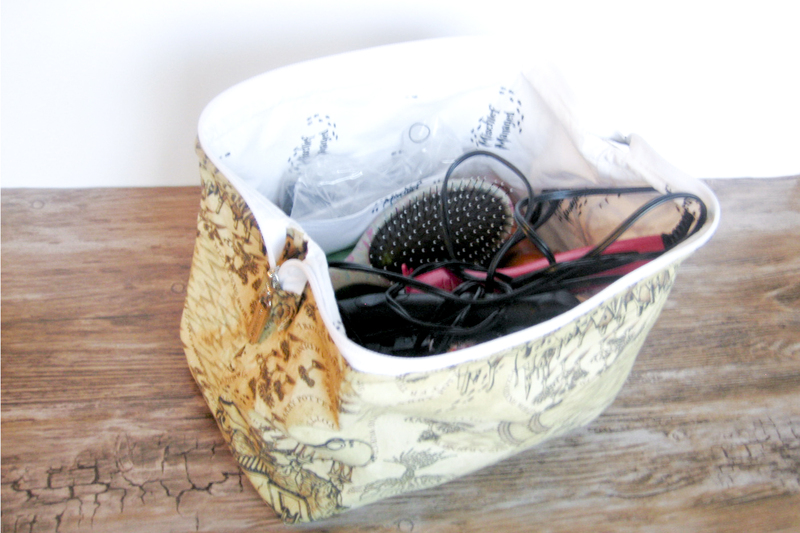 I love this bag, it was so easy and quick to put together! I still have three sets of wire frames (one large and two small). I can’t wait to make more! In the future, though, I will definitely be paying attention to the direction of the fabric. Harley stores all her hair stuff in the bag, so the flimsy sides aren’t a problem because the products hold the sides up. In addition, they actually make it a little more flexible when she closes the zipper. 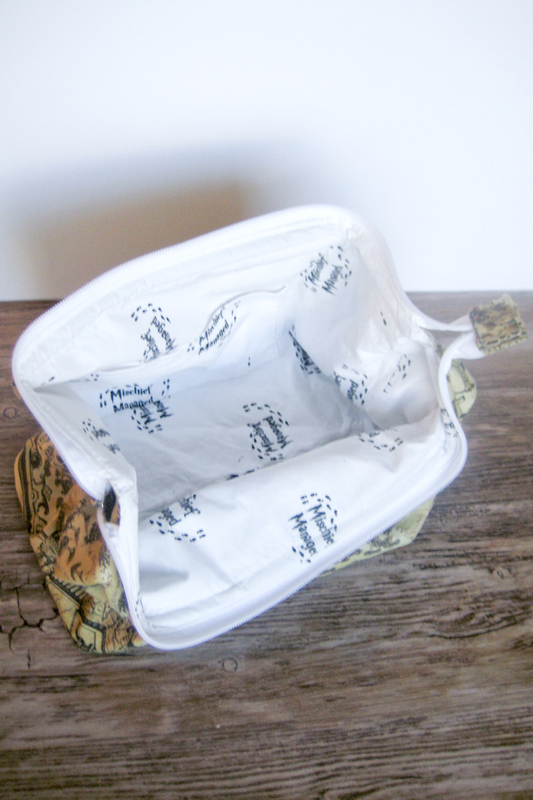 She is able to store a curing iron, hair dryer, brush, and spray in the main part of the bag, and she stores headbands in one of the internal pockets, and rubber bands in the other. 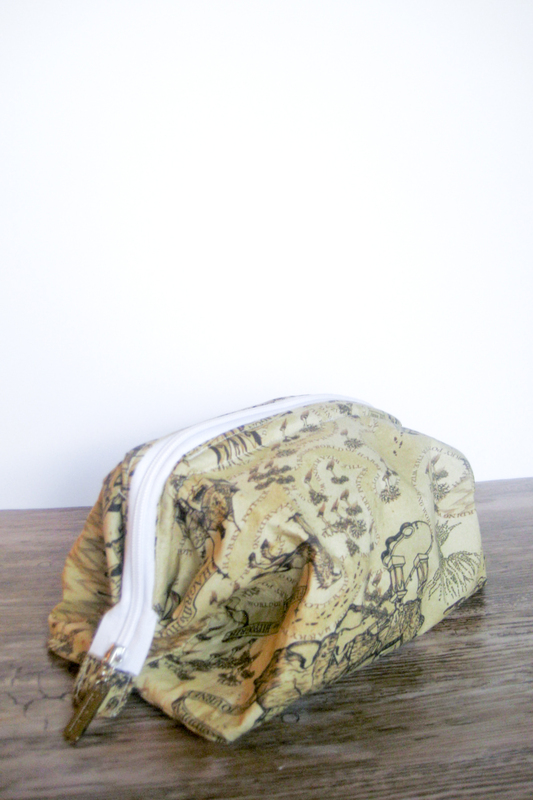 If you’ve been on the fence about making a bag with a zipper, jump right in and try The Retreat Bag! 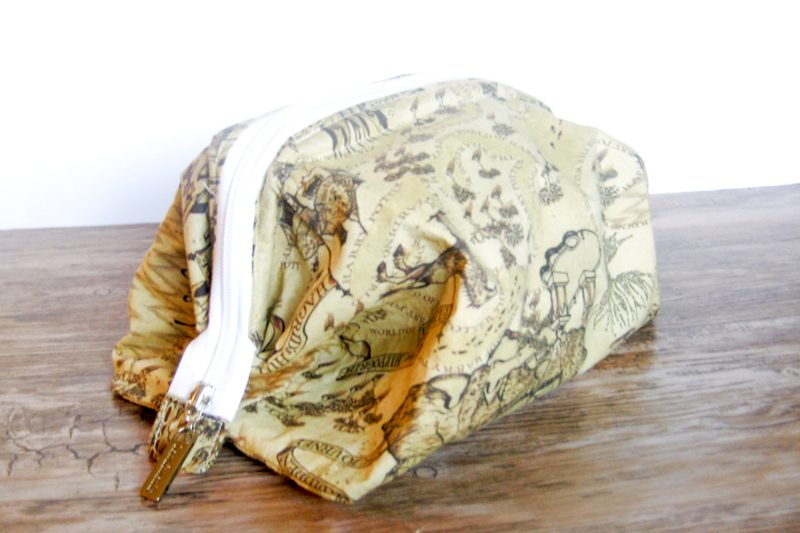 It is the perfect starter bag! I still have three sets of internal frames (one large and two small) and I cannot wait to get started on another one! I just bought the frames to make this bag over the weekend. I can’t wait to get them now! You did a fantastic job and I can’t even tell that the prints were “directionally challenged”. Great work!! Thank you! Harley really doesn’t care they’re upside down, she was just really excited to have them! I can’t wait to make more! Cute bag! Love that fabric. Thank you very much! Harley loves it, as well! How fun!! I’ve been looking for a good bag pattern and this may be it! Glad I clicked your link from Confessions of a Fabric Addict! Thanks for being honest about things I would really do (fabric direction)! I can learn from other’s mistakes! Thank you! I figure making mistakes is one of the best ways to learn. If I am honest about the mistakes I make, maybe someone else will read about it and not make the same mistake.